Many of the Germans who came to the United States in the nineteenth century ventured far beyond the Atlantic coast to seek their fortunes. 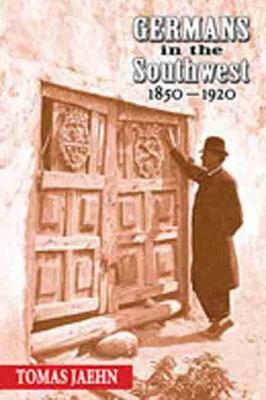 Tomas Jaehn examines the experiences of those Germans who settled in the Hispanic Southwest, especially New Mexico, up to the end of World War I.
Jaehn relies on literary works by Karl May, Balduin M llhausen, and Alphonse Bandelier to show how Germans viewed the region and its cultures and how they adjusted to life in the Southwest. His analysis of the Germans' economic, political, and social behavior suggests the region's Hispanic citizens were hospitable to both Jewish and Gentile German arrivals. The arrival of thousands of Anglo Americans by railroad in the early 1880s, however, caused all non-Hispanics to become racially and socially more aware. The long-established Southwest Germans began shielding their cultural identity by celebrating their ethnicity in clubs, churches, and temples that had long exemplified the German presence in the American Midwest. World War I and new immigration laws after World War I concluded the influx of Germans into New Mexico, but those who had arrived before continued their acculturation to the Southwest as well as the celebrations of their heritage. ""Germans in the Southwest, 1850-1920" is a splendid addition to studies of Euro-American ethnicity and acculturation in the developing American West." "This well-researched work competently documents German immigration and acculturation in New Mexico. . . A useful scholarly reference on an important aspect of New Mexico ethnicity." ""Germans in the Southwest" makes an important contribution to the history of ethnicity and ethnic relations in New Mexico and is a significant addition to the literature of German America." "Tomas Jaehn's "Germans in the Southwest" is a valuable contribution that brings much needed attention to Germans, and to various European immigrants, who in their different ways influenced the transformation of the region."